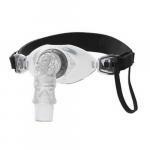 CPAP Masks are part of a CPAP system that delivers compressed air to a patient. The mask is a CPAP interface or appliance that comes into direct contact with the sleep apnea patient. It delivers compressed air to the nose and/or mouth of the patient; thereby, bringing breathable air to the patient’s airway passages. This webpage will cover how to select the best CPAP masks, CPAP masks for side sleepers and CPAP masks for mouth breathers. There are many different patient characteristics that drive the design and construction of CPAP masks. The key characteristics can be broken down into the following three categories: positioning, sensitivity and breathing. These characteristics play a critical role in selecting the best CPAP mask to meet individual needs. CPAP patients tend to favor particular sleeping positions. Some prefer to sleep on their back. Others prefer sleeping on their side. A few sleep on their stomach. Many patients switch up how they sleep night-to-night or several times during the same night. Nearly all masks support patients who sleep on their back. The two types of nasal masks support side sleepers very well. The best support for stomach sleepers is the nasal pillows mask, particularly the masks that route the supply hose from the top of the patient's head. Patients who tend to toss and turn throughout the night are best supported by the nasal masks. Nasal masks are the least intrusive and the most comfortable for varied sleep positions. Many CPAP patients experience sensitivity to the mask pressing-down on their forehead. This constant pressure keeps them annoyed and awake throughout the night. Some experience sensitivity to the bridge of their nose. These sensitivities can interrupt the patient’s CPAP therapy. Studies have shown that patients that experience these sensitivities have great difficulty complying with the number of sleep hours they should be getting with their CPAP mask. Most patients that have sensitivities experience great difficulty with using a full face mask. Several manufacturers have designed alternative full face masks that route the support frame and the headgear away from the forehead. Other manufacturers implement soft, contouring cushions in the areas that are sensitive to the touch. Many patients are able to adapt to other masks like the hybrid or one of the nasal masks in order to achieve a comfortable therapeutic sleep. Most patients breathe through their nose both awake and asleep. 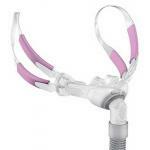 However, there are many CPAP patients that breathe exclusively through their mouth during sleep. It is ineffective to force patients to use CPAP therapy through their nose when they are not accustomed to breathing that way. There are also patients that tend to switch from nose to mouth breathing several times throughout the night. 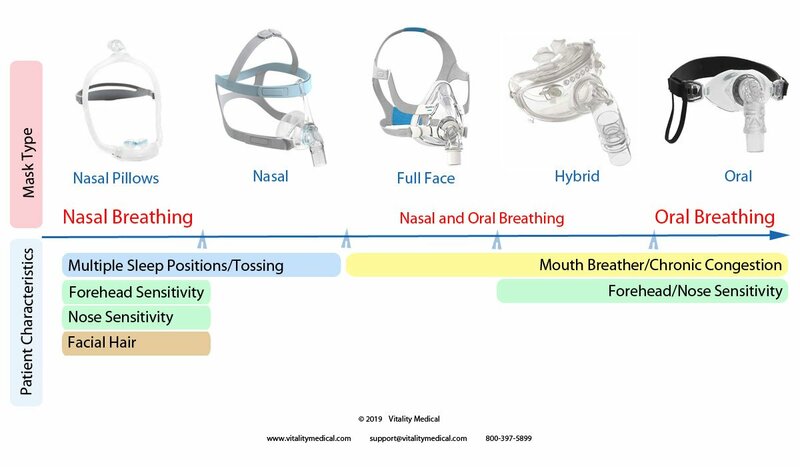 CPAP manufacturers design masks to accommodate these different breathing preferences. The full face mask and the hybrid mask allows patients to breathe through their mouth or nose. The hybrid mask also has the advantage of avoiding the sensitive areas of the forehead and nose bridge. For patients that breathe exclusively through their mouth, the best option is the oral mask. 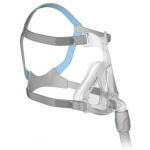 There are five different types of sleep apnea mask for sale—nasal pillow, nasal, full face, oral, and hybrid. The differences in these masks attempt to accommodate the different patient sleeping characteristics discussed above. Different design styles adapt to the patient’s facial features, size, sleeping patterns and breathing habits. Each characteristic targets specific needs of CPAP patients. The venn diagram below color codes each mask type and displays which masks best meet patient sleeping charactertistics. In many instances, several masks can meet a patient need as displayed where the bubbles intersect. 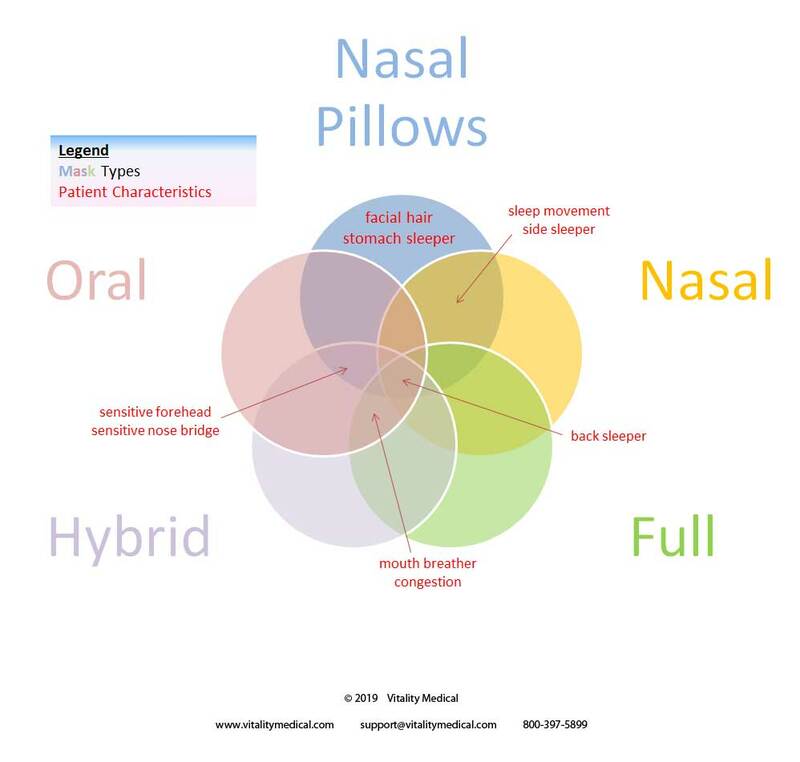 For example, patients that experience sensitive forehead and nose bridge problems are best served by nasal pillows masks, oral masks or hybrid masks. Likewise, these patients would want to avoid a full face mask or a nasal mask to limit contact with sensitive areas. Patients should be very selective in choosing a mask design that will meet their sleeping needs. Medical researchers have found that compliance by CPAP patients in wearing their mask appliance is very low, particularly when they are using the wrong mask for their needs. The ability to wear glasses, watch TV or read a book is not a sleeping need. Sleep apnea occurs during sleep not while reading or watching TV. 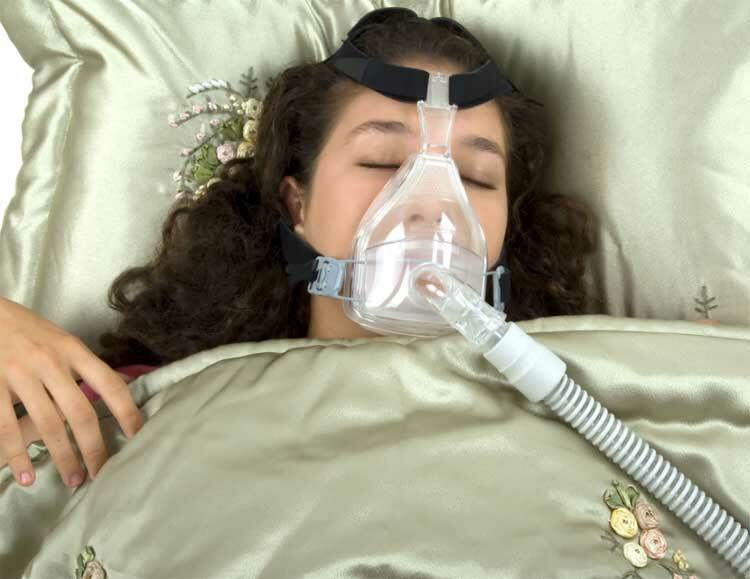 There have been a few articles posted on the Internet about wearing CPAP masks while watching TV or reading books and which type of masks can best accommodate these tasks. Instead, patients need to be concerned about masks that accommodate sleep. This can best be achieved by matching the patient’s characteristics to the mask’s characteristics. 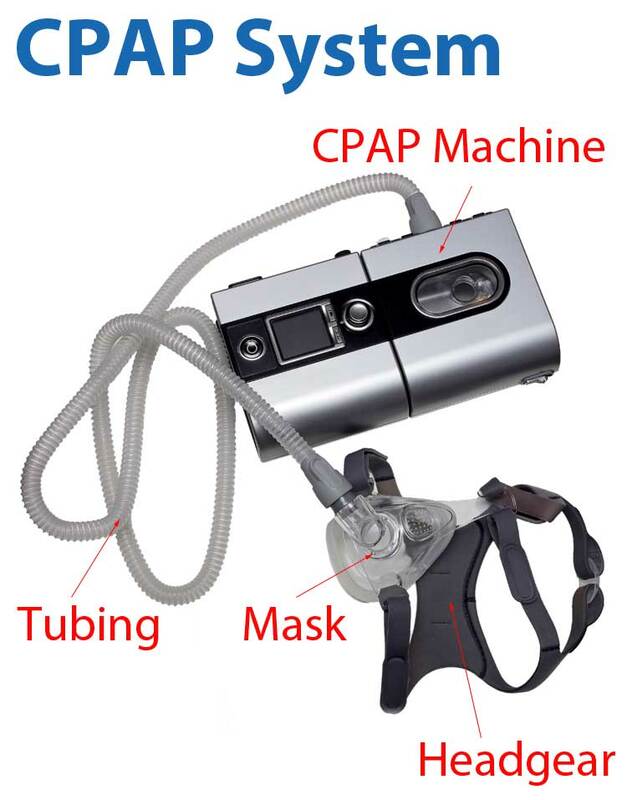 Below is a short summary of the CPAP machine mask types and a link to more specific information about each individual mask. Patients should be very selective in choosing a mask design that will meet their sleeping needs. 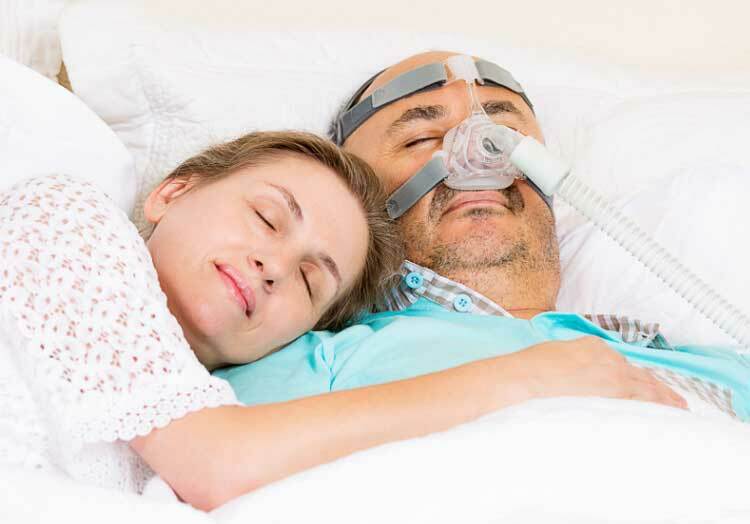 Medical researchers have found that compliance by CPAP patients in wearing their mask appliance is very low, particularly when they are using the wrong mask for their needs. The ability to wear glasses, watch TV or read a book is not a sleeping need. Sleep apnea occurs during sleep not while reading or watching TV. There have been a few articles posted on the Internet about wearing sleep apnea machine masks while watching TV or reading books and which type of masks can best accommodate these tasks. Instead, patients need to be concerned about masks that accommodate sleep. The different designs employed in CPAP sleep masks accommodate the needs of individual patients. One specific design will not support the needs of all patients. 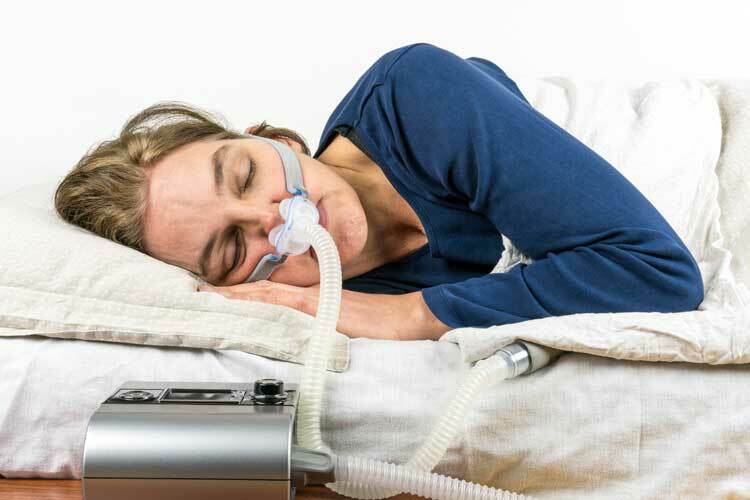 A review of the patient’s sleeping and breathing habits compared with the characteristics of each mask should lead to choosing the best CPAP mask for their specific needs. Individuals with facial hair find it difficult to maintain an adequate seal with their mask. The best mask choice for people with beards are the masks with the least facial contact. Therefore, patients with facial hair should consider a solution from the nasal masks or the nasal pillows masks that offer the least amount of contact with the face. Practice applying and removing your breathing machine mask while looking into a mirror. Always use your headgear connections to apply and remove your CPAP breathing mask. By stretching the headgear over your head, you will shorten the lifespan of your headgear. If you wake up with a dry mouth, you may be breathing through your mouth while you are asleep. It may prove beneficial to use a chin strap or switch to a full face model. Should fit snug, but should never cause pain or discomfort. If your mask is causing you pain or discomfort, try loosening your headgear. Should never leak into your eyes, around your cheeks, chin or upper lip. If you can hear or feel a pressure leak, try slightly tightening the headgear. Mortimore, I. L., A. T. Whittle, and N. J. Douglas. "Comparison of nose and face mask CPAP therapy for sleep apnoea." Thorax 53.4 (1998): 290-292. Teo, Ming, et al. "Equivalence of nasal and oronasal masks during initial CPAP titration for obstructive sleep apnea syndrome." Sleep 34.7 (2011): 951-955. Borel, Jean Christian, et al. "Type of mask may impact on continuous positive airway pressure adherence in apneic patients." PloS one 8.5 (2013): e64382.